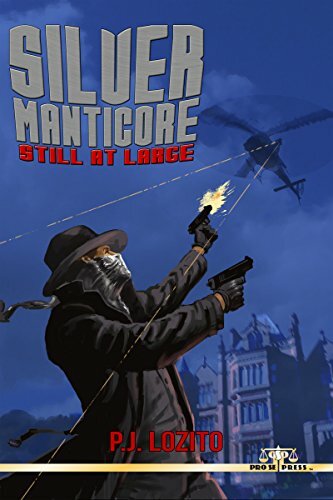 SILVER MANTICORE: STILL AT LARGE featuring a captivating cover by Adam Shaw and print formatting and logo design by Antonino lo Iacono and Marzia Marina is now available on Amazonat https://www.amazon.com/dp/197426324X/ref=sr_1_2?ie=UTF8&qid=1501941887&sr=8-2&keywords=silver+manticore%3A+still+at+large and in Pro Se’s own store at www.prose-press.com/store for only $15.00. The continuing adventures of the Manticore are also available as an eBook formatted by Antonino and Marina for the Kindle at https://www.amazon.com/dp/B074KVJ5ML/ref=sr_1_1?ie=UTF8&qid=1501903612&sr=8-1&keywords=silver+manticore%3A+still+at+large for only $2.99. This book is also enrolled in Kindle Unlimited and all members of Kindle Unlimited can get it for free!